My top 10 Favorite Movies of all time! Last night while laying in bed waiting to drift to dreamland, not sure why, but all I could think of was Movies! My fave fave movies! I lie there putting up fingers, counting...trying to pick my top ten. The first three came easy...the rest weren't too much of a struggle. But trying to put them in order...impossible. 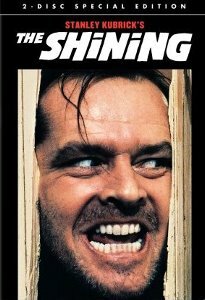 One thing I do know for sure though is that my absolute fave fave fave of all time is The Shining. Oh jeez, the soundtrack is so so good...the music in the opening scene as you see an aerial view of the mountain road leading to the hotel. 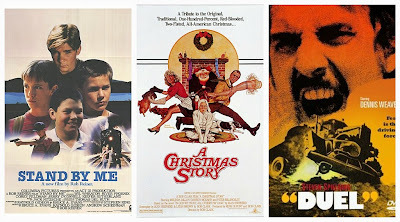 People might like holiday style movies on a snow day at home. I think...The Shining! I could watch it over and over and over. It sets a mood like no other...just a perfect pace. When I was growing up my dad looked a LOT like Jack. 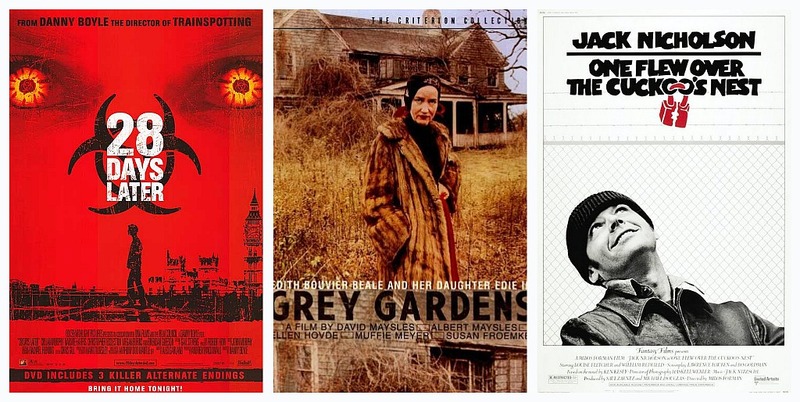 And yeah, if you're peeking ahead at the rest of the list you'll see that Jack stars in 3 of my top 10! Around the time of Easy Rider my dad was stopped by people all the time. And around the time of The Shining he'd pull back his hairline and grin to do the impression. I'm not sure if my dad's likeness has anything to do with my Jack obsession. 28 Days Later...maybe true Zombie enthusiasts say that this isn't a Zombie movie...but more of a Plague movie... (Well, I'm a Zombie nut through and through...but I'm not that big on technicalities) I just know that it's Zombie movie to me...and again...the soundtrack in the opening sequence of an abandoned London...Incredible! Grey Gardens...what can I say about it? It really deserves it's own post entirely. When you're through watching it...if you're not repeating parts of it over and over then you just didn't watch closely enough. Big Edie and Little Edie...the two most unwitting film icons ever! And Cuckoos Nest... the end breaks my heart every time. And every scene leading up to it speaks volumes about how we all manage to get-by in life in our own way. I remember seeing Stand By Me for the first time... it was just so perfect for a kid...every part was better than the last. I remember calling the radio station requesting the song...hahaha! A Christmas Story is a hands down classic in anybody's book. I mean, they do 24 hour marathons of it every year on tv. Like Stand By Me it's a movie that portrays an earlier period of growing up in a America...but it was made when I was growing up...so these films feel old when in fact they were conteporary. Duel...I saw it for the first time, home alone, glued to the tv...So simple and perfect. A horror movie like no other...Dennis Weaver is Incredible! And lastly, is the oh so perfect Sixteen Candles. I bring this movie up all the time to my younger brothers. And recently I was shocked to learn that my brother Jason has never seen it. I momentarily questioned our blood relation. For some reason Jason cannot bear to watch movies that "look old". Anything prior to let's say...the 1990's...turns his stomach and doesn't hold his attention...weirdo. I'm the opposite...if flipping through channels and I see a movie that looks like an "Instagram"... I jam on the brakes. Anyway, this post... Random? yes. Fun? absolutely. If you'd like to join in the random fun and list your fave 10...comment/link back...so I can come see them. :D Def. on my top 10! Your side notes were so entertaining to read through! You guys might really like some of the goodies I am giving away this year!!! Lots of pink and blue! Icing and cupcakes, sweets and treats! Goonies and The Shining are both in my top 10 too!! oh my gosh, oh my gosh, oh my gosh... I loved Goonies. I had forgotten about that movie.